With a few years behind him on the Mount Kisco dining scene, Executive Chef Michael Williams diligently goes about the business of running a successful kitchen and restaurant. Winston, named after Williams’ pitbull terrier, is a beautiful three level restaurant with a rooftop bar and lounge serving innovative modern American fare. 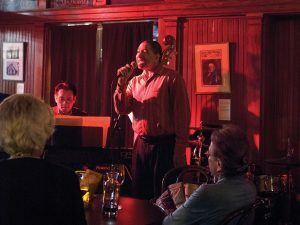 Besides the steady stream of diners coming for the food, a growing music scene has enticed new guests to visit and enjoy live music offered on Tuesdays and Wednesdays. A veteran of some of the finest kitchens in Manhattan including Park Avenue Café, DB Bistro, Oceana, and Mirezi, Williams paid his dues working methodically up the kitchen hierarchy. Raised in Korea in a food-focused home by his Korean mother and American father, who worked at the U.S. military base there, Williams learned to appreciate good food at a young age. His mother taught him Korean cooking and his father, a bit of a gourmand, taught him American and international cooking. Honing his skills and pursuing as much experience as possible, he worked at many New York City restaurants over the course of a decade, always seeking new challenges and cuisines. “I gravitated more to the French kitchens because they were natural teachers. When you work in a French restaurant, in which I worked quite a few, the chefs would go out of their way to explain the process of what you were doing and why each step was important,” he explains. Williams’ years of experience and training with some of the best chefs is evident in his food. While they call themselves modern American, the French technique is behind a lot of Williams’ dishes, and there are flairs of Italian, Asian and other cuisines. “The menu is a reflection of my experiences and comes from my palate which was developed working in various kitchens and my cooking is heavily influenced by French kitchens,” says Williams. “The menu is also dictated by the palate of our guests. As Michael has been the chef of this kitchen for over four and a half years, his menu has evolved to what our guests like, still using his techniques and ideas but tweaking them in the direction that our audience is really looking for,” says general manager Jimmy Branigan. Keeping things fresh, there are always seasonal offerings and specials. Williams visits local farmers markets regularly and tries to utilize as many local products that he can. My favorite dishes on a recent visit there were the Spicy Tuna and Avocado Toast off the bar menu and the whole roasted trout as an entrée. My husband thought that the mushroom spring roll was the best he had ever had. The Asian hanger steak was delicious with just the right amount of Asian-inspired seasoning. Having trained in the pastry program at the French Culinary Institute, Williams’ expertise shines through in his desserts. 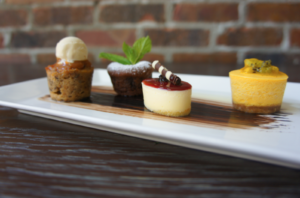 All desserts, including ice cream and sorbet, are made fresh on site in a dedicated pastry kitchen. The crème brulee trio was perfection. The beautiful townhouse setting designed by Grandberg & Associates Architects lends to the comfortable and sophisticated atmosphere. The tri-level restaurant has a casual feel but with tablecloth type service. In warmer weather, they open up the indoor/outdoor rooftop area. In the winter, the space is enclosed and is available for private events. Private parties can also be accommodated throughout the restaurant. 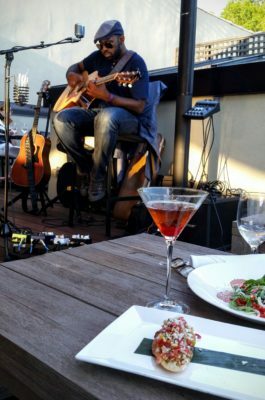 Bringing in guests on traditionally slower nights, live music is performed on Tuesdays and Wednesdays from 6pm-9pm. Drew Bordeaux, who was born and raised in Mt Kisco, is their resident Tuesday artist. Bordeaux’s solo performances, influenced by blues and popular radio, are made up of percussive acoustic guitar and soulful vocals, entwined with live loops and violin solos. He “has a Sinatra way about him and really plays to the crowd,” according to Branigan. 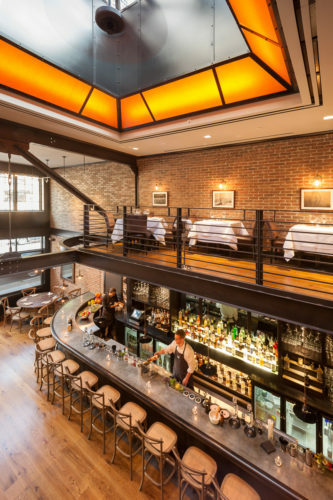 Every other Thursday, Winston brings in a guest sommelier from an importer, distributorship or vineyard and they feature a handful of their wines, inviting guests to taste the wines and suggesting pairings with the menu. This is a fun opportunity for guests to try new wines and cultivate their wine knowledge. Adding to their diversity of offerings, Winston also has a large format program, where they serve wine aged in large bottles ranging from 1.5 liters to 5 liters. Guests can experience wine bottled in a larger vehicle, which ages slower and results in a smoother and rounder finish. It’s no wonder that the restaurant has received an Award of Excellence from Wine Spectator magazine. If you haven’t already been, Winston is worth a visit and may soon become your local favorite spot. Reservations are recommended. Looking for a cozy bistro with small romantic tables, farm fresh food and inventive cocktails where you can hear jazz on a Saturday night? Then head down to Chappaqua Station, opened by restaurateurs and jazz aficionados Erin and Peter Chase last year. Like me, you may be surprised to learn that the place many see as the newest breakfast and coffee spot in town takes on a totally different persona at night, drawing on prime local talent as well as top musicians from Harlem and other parts of the city. 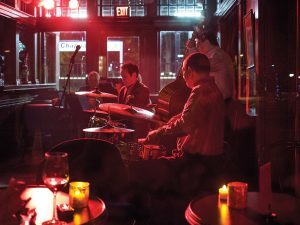 Wander in nearly any Saturday night at 7 p.m. when the lights go down low, replaced by the warm glow of candles and tiny twinkle lights on the ceiling, and hear the sultry tones of the latest jazz ensemble. Whether you are a jazz lover or simply a romantic, it’s the perfect date night venue. The Chases transformed the timeworn 1902 Chappaqua train station into a beautiful eatery, restoring the old scarred interior so that the wooden walls, benches, and ceiling gleam much as they must have at the turn of the last century. The benches around the perimeter still serve as some seating and the former ticket office has become a full-service bar, with light from the train platform streaming in behind, adding to the atmosphere. Hiroshi Yamazaki, whose Hiroshi Yamazaki Trio performed the night my husband and I discovered this charming jazz venue, confirmed that their efforts have paid off, citing the excellent acoustics as one of the reasons he enjoys playing there. Yamazaki, a classically trained pianist who studied jazz in New York as well as his native Japan, has performed all over the world, as have his bandmates bassist Steve LaSpina and drummer Tony Jefferson. There’s a $10 per person cover charge for tables (no cover at the bar, which is first come first served), with tickets available via www.eventbrite.com or at the door. Reservations are suggested. Upcoming talent in December includes the Daniel Lauter Jazz Quartet who will play at a fundraiser for Habitat for Humanity “Homes for the Holidays” on Dec. 3, 7-10 p.m. to raise money for four homes being built in New Castle. Tickets are priced between $50-500. Dec. 10, Latin percussionists Emedin Rivera and Ken Kresge Quartet. On Dec. 17, Erik Lawrence and Mala Waldron Quartet. See www.chappaquastation.com for additional events. Marianne A. Campolongo is a professional photographer, freelance writer and jazz lover who lives in Chappaqua. Early on in their life together, she and her husband Rob used to haunt The Blue Note, The Village Gate, and other notable jazz venues, and they are both thrilled to live so close to this little gem.